Five years ago last month, as New Zealand’s Trade Minister, I signed our Free Trade Agreement with China. It was a big occasion in the Great Hall of the People in Beijing, witnessed by Premier Wen Jia Bao and Prime Minister Helen Clark. Negotiating a trade deal is never an easy process. There are always vested interests who will oppose it. There were people who feared that the asymmetrical size of our countries, New Zealand with 4.3 million people and China 1.3 billion, meant that we could not negotiate something that was in our interests. We did, and today there is overwhelming support for an Agreement which has really delivered for New Zealand. I rate the Free Trade Agreement with China as one of my most important achievements for New Zealand. It stands alongside a decision I made as Minister of Education in 1989 to change the law to allow fee-paying international students to study in New Zealand. That too was criticised at the time but today international students are one of our biggest income earners contributing over $2 billion a year to our economy. The biggest group of those students are from China. The Free Trade Agreement with China was its first and to date only one with a developed country. It has given New Zealand huge first mover advantage for exporting into China’s quickly growing economy. The comprehensive and high quality agreement was achieved because we had built a strong relationship with China based on trust and recognition of our good faith as a negotiating partner. I predicted at the time that the Agreement would increase New Zealand exports to China by up to $350 million a year. In fact we have done better than that with our exports trebling to $6 billion over the period. Our trade deficit with China has shrunk significantly as a result. This year, China has become our biggest market for exports as well as our largest source of imports. It is also our second biggest country of origin for tourists and the biggest source of international students. The timing of the free trade agreement, just before the Global Financial Crisis, was important. China’s continued growth and increasing demand for our products and Australia’s helped New Zealand emerge from the crisis in much better shape than would otherwise have been the case. Yet there is no room for complacency. Over 90 per cent of our exports are primary products, led by dairy with timber, meat, wool and fish also important. Such overwhelming reliance on commodities carries with it risks. We need to add value to and to diversify our exports. We must protect our reputation for high quality and safe food products. There are important lessons to be learned from the handling of the DCD contamination issue to avoid future incidents that could jeopardise that reputation. We also need to expand our exports of high tech products and look for new niche markets. Lanzatech, Atrax, Orion Health, Gallagher Security and Scott Technology are just a few examples of how at its best New Zealand can out-compete the world and succeed in the Chinese market place. Prospective exporters to China need to properly research the market-place, build long term relationships and invest time and money if they are to be successful. Organisations like the New Zealand China Trade Association can provide invaluable mentoring relationships for prospective entrants into the market. New Zealand Trade and Enterprise is working with 50 or more successful, profitable and rapidly growing companies to help them achieve their full growth potential in China. It provides a training programme on doing business in China for those newly entering the market. Businesses should be utilising the skills of Chinese New Zealanders who understand Chinese language, culture and ways of doing business. If New Zealand is really serious about maximising growth in areas such as tourism, we need to fast track the learning of Mandarin in our schools. That means offering courses in Mandarin across the school sector. Providing opportunities to learn Chinese is taking far too long and needs to be implemented more quickly. Tourism out of China is expected to double to 100 million in the next five years. If New Zealand wants an increasing share of that tourism, we must adapt quickly to ensure we can meet the needs of those tourists. To attract more students, government must play a proactive role in assuring the quality of the education and the pastoral care given so that we are able to protect and enhance our education brand. Five years ago, I told the Navigating China Seminar in Beijing that the Free Trade Agreement opened the door for trade with China more widely than before and created big new opportunities. But I said it was up to business in New Zealand to actually go through the door and seize those opportunities. Governments don’t trade. Private sector businesses do. What the government, at central and local levels, can do however is to help build a New Zealand Inc approach, ensuring our resources and services are targeted and cohesive to maximise our success. It must also ensure that we retain a strong and resilient political relationship, building on the four firsts in trade with China that the Labour Government achieved with the signing of the Free Trade Agreement in Beijing in April 2008. 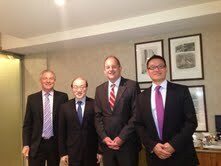 Pictured: Phil at a meeting with Mr Liu Jieyi, Vice Minister of CPC International Department, David Shearer MP and Leader of the Labour Party, and Raymond Huo MP.